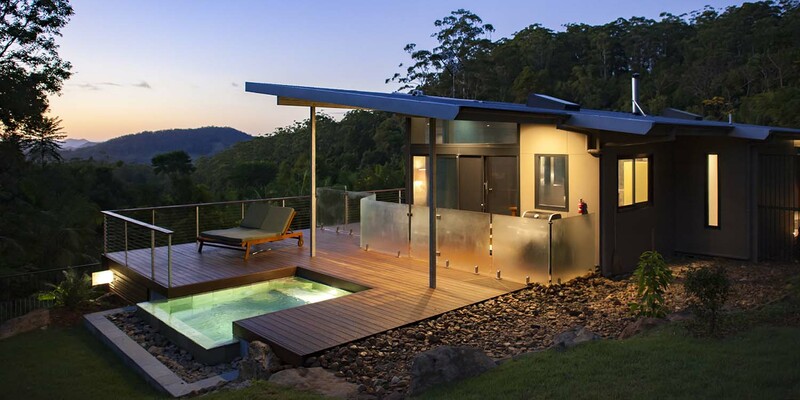 Luxury Mountain View Lodges, romantic private getaway with double spa bath, fireplace, and plunge pool close to Numinbah, Springbrook, Tamborine, Lamington, the Gold Coast and Byron Bay. 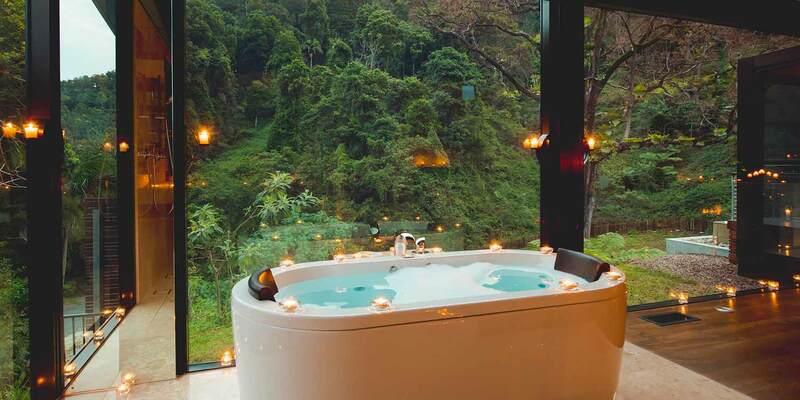 Higher in the Retreat, each Luxury Mountain View Lodge presents a breathtaking aspect to the surrounding landscape, magically combining lofty mountain ridges on high with tropical valleys of genuine old-growth rainforest and stoic trees that have stood for centuries. The beginning and close of each day are imbued with the epic, aeons-old mystery of an ancient forest setting. 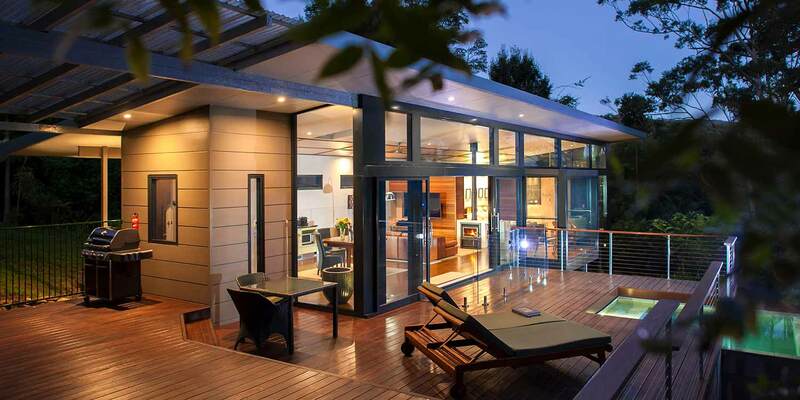 Including the deck, the floor space of the architect-designed open plan is over 150 square metres. 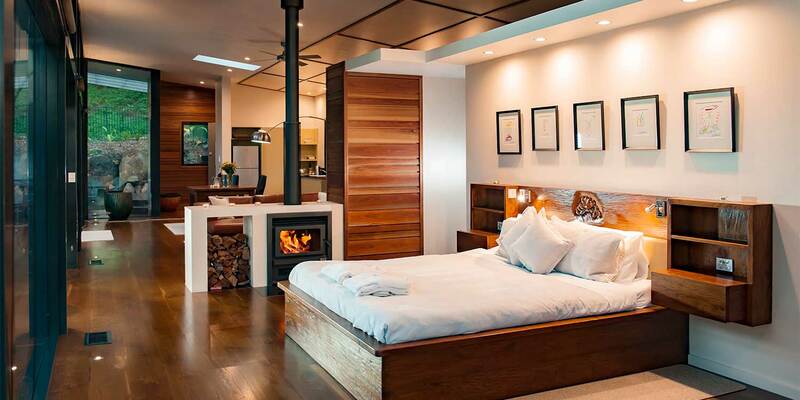 A cosy, romantic double-sided fireplace screens the bedroom from the generous living area, with a big clear skylight (with block-out blind) above the bed for stargazing. Reverse-cycle air conditioning keeps you comfortable all year round. A walk-in wardrobe provides generous space for suitcases and the like. 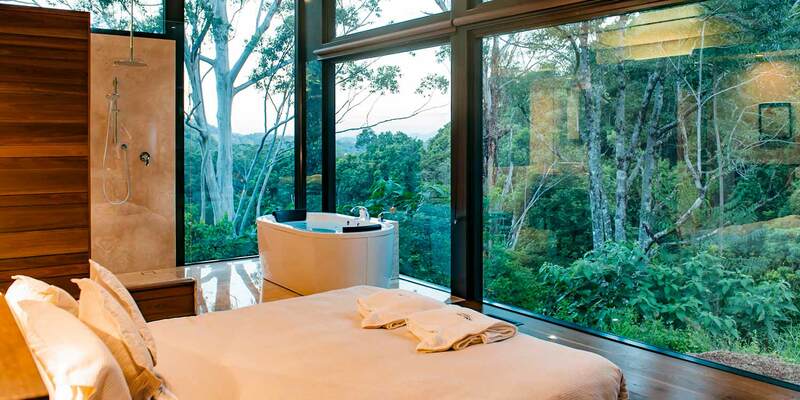 In the bathroom, floor-to-ceiling windows integrate the stunning beauty of the rainforest with the indulgence of the luxury double solid marble bath or freestanding spa bath. Recycled French oak floorboards add a glamorous patina throughout. The private decks on these Lodges incorporate a stainless-steel roasting barbecue and plunge pools with wet edges on three sides. When the sun is shining the solar-heated pool will be warm for all but the four coldest months of the year. In winter, when our environmental responsibility takes precedence, you can indulge in the cosy warmth of the double-sided fire inside. The modern energy efficiency technology in the Lodges makes your stay extremely comfortable while being environmentally conscious. In addition to the thoroughly insulated walls and ceiling, the superior insulation properties of the floor-to-ceiling ‘Comfort Plus’ glass very effectively keep the heat in during winter and out in summer. 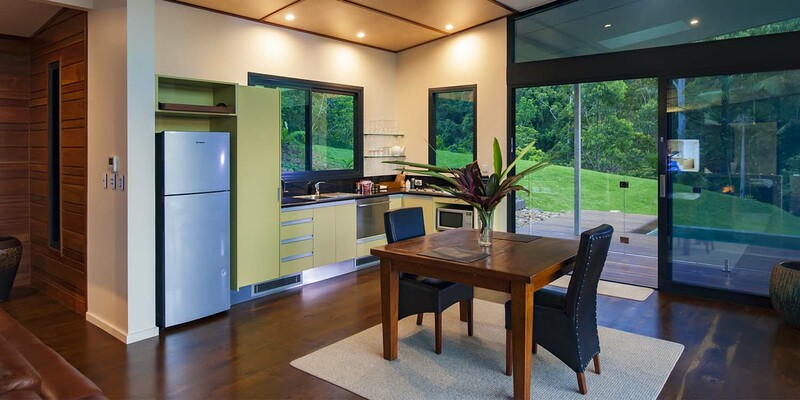 Our five Luxury Mountain View Lodges, Numinbah, Springbrook, Byron, Tamborine and Lamington, have everything that makes all our bungalows comfortable and luxurious, plus much more. Each lodge accommodates one couple only. NOTE: We regret that we cannot book Luxury Mountain View Lodges individually, as the allocation of the Lodges is adjusted to suit the flow of bookings. 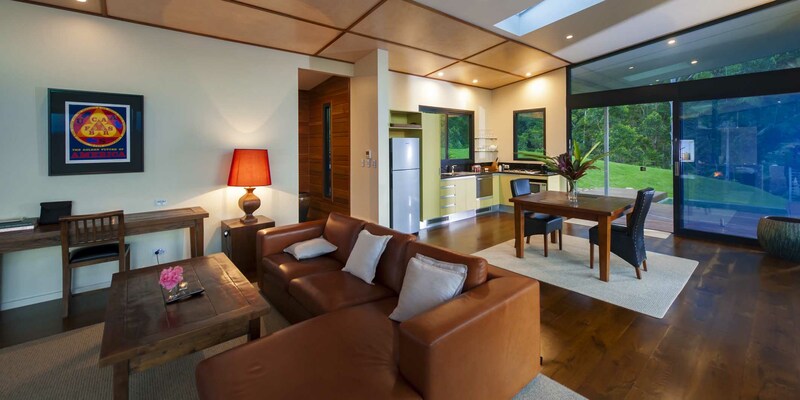 As each Luxury Lodge has its own placement within the Retreat it will also have its own subtle differences, but each Lodge provides an absolutely premium and truly unforgettable rainforest getaway experience. 17 December 2016There could be no better place to celebrate our wedding anniversary. The Numinbah Lodge at the top of the retreat was outstanding. We loved the pool, the chorus of the cicadas and frogs, the lush rainforest, the birdlife and the privacy. The service by the staff was also outstanding. Thank you for a wonderful time. 27 May 2015My new husband and I stayed in the mountain view lodge for a week on our honeymoon and we couldn’t fault it. The accommodation was so stunning and so beautifully set out. The food was delicious and our massages that were included in our package were divine. We loved the scenery and the wildlife, especially when it’s right at your front door!! There were many surprises along the way and we really did love this place!! Couldn’t of had a better honeymoon!! 15 February 2016Fantastic stay. We loved everything about the Retreat. Will highly recommend to our friends. Thank you so much! 15 July 2017We spent a couple of nights here just relaxing and taking walks in the beautiful forest all around the retreat. It was sheer heaven to spend time in such a gorgeous outdoor environment, and then to unwind in the luxurious lodge. We didn’t see or hear any other visitors during our stay, as we ate on our deck, read, ate the delicious meals overlooking rainforest or watched DVDs curled up on the sofa. Total bliss, worth every penny. 24 June 2018This was our first stay here and we were extremely impressed by the whole atmosphere here. The staff were so friendly and welcoming and the additional facilities were fabulous. The lodge itself was absolutely breathtaking and we couldn’t get over what amazing views and architecture the lodge had. We loved all the wood! So many great options for the walks and even the orchard picnic area. Was a lovely and quiet and we had a great time relaxing in the hammocks. We will definitely be back for a longer stay next time for sure. Was sad to leave such a lovely place. 2 January 2017Thank you for such a wonderful stay. This truly is a little slice of heaven up here and we hope to be another time. We loved the glow worms, creek and our beautiful lodge. 25 January 2016Was it all a dream? Seriously… Well done to you all here at Crystal Creek Rainforest Retreat. We absolutely LOVED it. 8 October 2016A perfect way to unwind and celebrate our 10 year anniversary. P.S. We will be back for another stay. 10 November 2017Thank you so much for an incredible stay. So romantic and the candles, flowers and champagne surprise for our engagement was perfection. 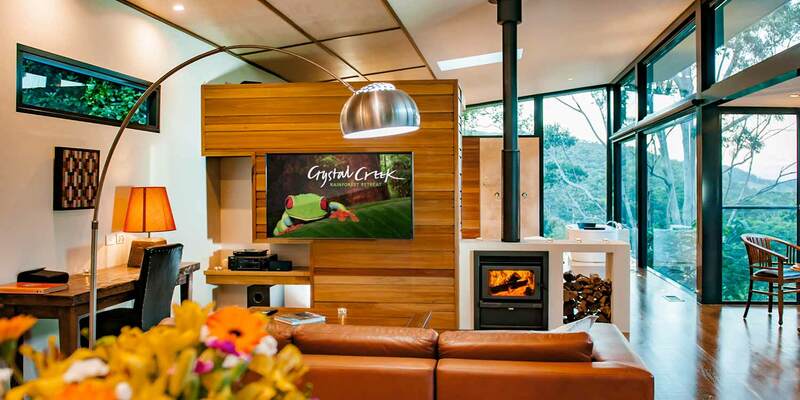 22 October 2018If you are looking for an amazing getaway, Crystal Creek Rainforest Retreat is simply the best. Great place to relax & reconnect. We both just loved our entire stay. Meal baskets are very nice and easy to prepare at your own time. 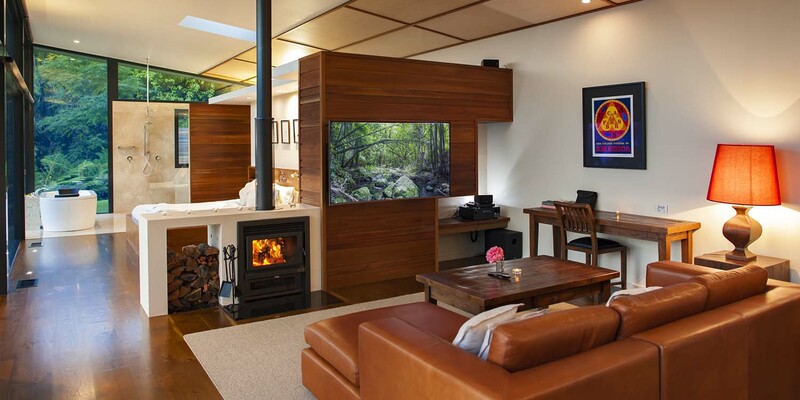 Private and secluded Villas that look out through wall to ceiling glass. Private infinity swimming pool, and outdoor deck. BBQ for cooking outdoors. Internet and phone reception can be limited, which I think was an advantage to hang out and focus on each other. 13 October 2016Everything was just beautiful for us to relax and enjoy every moment. We will be telling everyone about our stay here and would recommend a trip here anytime. Thank you. 15 June 2017Stayed here for Wedding Anniversary long weekend getaway. 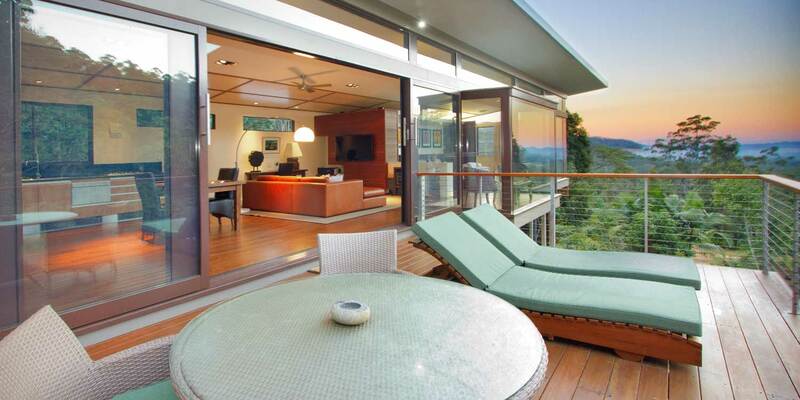 My husband booked Lamington Lodge overlooking rainforest mountain. Everything was superb! 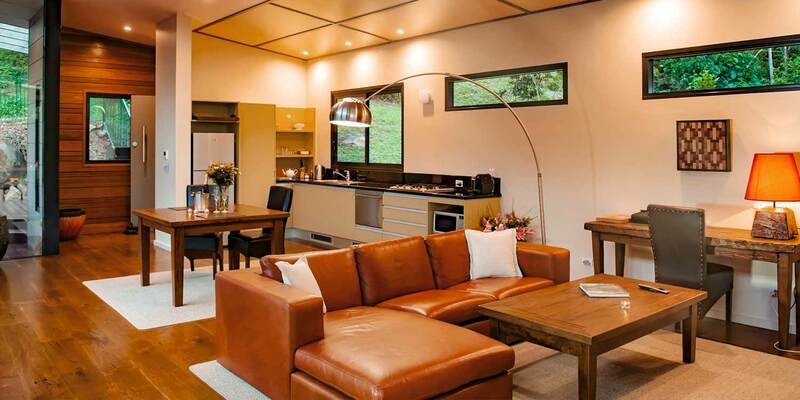 Accommodation outstanding, spacious, comfortable & beautifully designed. All meals divine, fireplace ready, dinner ready in fridge as organised. 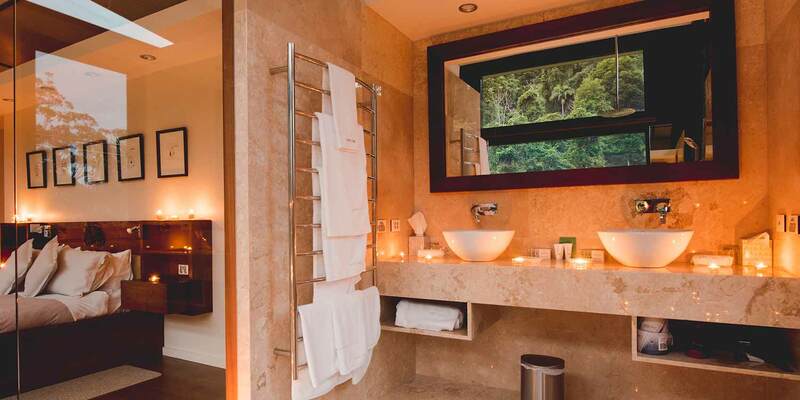 Rainforest breathtaking, interior & exterior lighting perfect as well as loads of candles. Totally Private top shelf No Work luxury getaway. Would return & recommend in a heartbeat. 7 January 2018Thank you for such a magical weekend away. Couldn’t have imagined a better way to get engaged. We will be coming back with my fiance, friends and family. 30 December 2017The Mountain View Lodge is absolutely spectacular. We love every bit of it, particularly the pool and the expansive views from the spa bath and the king size bed. It was a very relaxing stay, we will be back in winter. Thanks!